Dr. Hoa Dao specializes in the field of endodontics. His keen attention to detail has led to him to perform superior service for each patient’s circumstances. Dr. Dao uses state-of-the-art, advanced instruments in microscopic endodontics to assure accuracy for the treatment and pain control of the root. Dr. Dao is a board-eligible endodontist with six years of experience. He attended Case Western University and completed his Doctorate of Dental Surgery in 2000, where he graduated first in his class. He then served as a dental officer in the US Navy, during which he provided dental services to our troops during Operation Iraqi Freedom. Dr. Dao was chief dental resident at the Naval Medical Center San Diego. 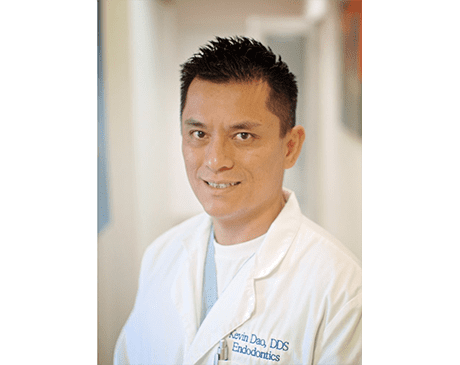 Once his active duty was completed, Dr. Dao made the decision to further his education and specialize in the field of endodontics. He attended University of Southern California where he received his certificate in endodontics in 2005. Dr. Dao continues his education throughout the year. In addition to taking CE courses, he has also given lectures and presentations at local study groups. In order to continue providing the best care to his patients, Dr. Dao has committed himself to keeping ahead of the curve with current literature and modern advances in treatment. Originally from Sauvignon, Vietnam, Dr. Dao currently resides in San Marcos with his wife, Thi Thi, and their dog, Daisy. He enjoys maintaining his health, as well as his physical and spiritual well-being, by running, swimming, hiking, and keeping his mind sharp. Dr. Dao is also honored to help those in his community by volunteering at the local YMCA and being an assistant Boy Scout leader.